Atoning for their recent offering of bawdy Neapolitan cantatas, I Turchini here do penance in music associated with the chapel of San Gennaro, the saint chosen as the official protector of Naples. The sole familiar name, Domenico Scarlatti, is represented by three tantalisingly brief string sinfonias, plus an exuberant and touching motet, Antra valles, he composed for Naples at 16 — his earliest surviving work. Other highlights are the once famous Stabat mater for four voices by Scarlatti’s virtually forgotten contemporary Nicola Fago and the operatically vivid Canzona per S Gennaro by a Neapolitan of an earlier generation, Cristoforo Caresana. 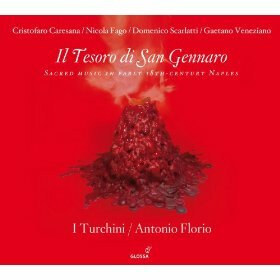 Directed with verve and stylistic understanding by Antonio Florio, singers and players enliven all the music on this disc. Violins spar ebulliently in the Scarlatti sinfonias. In two solo motets by Gaetano Veneziano, Pino De Vittorio’s raw, earthy tenor might take some getting used to, though he compensates for a lack of tonal allure with his fervent directness of declamation’. With their chaste, ‘instrumental’ timbre, the two nimble sopranos impress in their solos in Antra valles, as does countertenor Filippo Mineccia in the gravely reflective ‘In corde suo fido’ from the same Scarlatti motet. In the ensembles you sense the soloists responding eagerly to each other’s phrasing and balancing their contrapuntal lines, always underpinned by a rhythmically lively continuo bass. With most of the works otherwise unavailable, this can be enthusiastically recommended to anyone curious to venture beyond the handful of Italian sacred Baroque favourites.